As Of Now:How Do u Feel about the Unova/Isshu Region and the Best Wishes Series? Who do u think Ash should be with?/Who do u think Ash likes best? Who do u think should have won the Wallace cup contest??? Did u Like the Pokémon oranje Islands Episodes? 1. That the supposed "donuts" in the PokeMon T.V. toon are actually riceballs? People in Japan eat rijst -- and lots of it, too. 2. That the Pokemon comic book outsells any other comic book, including X-Men? This feat has been acomplished door selling the comic at toy and video stores. Electric Soldier Porygon: "Dennō Senshi Porygon" (でんのうせんしポリゴン ,Dennō Senshi Porigon?, literally "Computer Soldier Porygon", although most commonly translated as "Electric Soldier Porygon") is the thirty-eighth episode of the Pokémon anime's first season. It was first broadcast in Japan on December 16, 1997, and has since not aired anywhere else. In the episode, Ash and his vrienden find at the local Pokémon Center that there is something wrong with the Poké Ball transmitting device. To find out what's wrong, they must go inside the machine. Contrary to populair belief, the Pokemon TV series isn't how the craze was started. It was actually started with the Game Boy game called "Pocket Monsters" in Japan in 1995. It was an instant hit and it eventually got it's own TV series of the same name in April of 1997. 3. u claim to be a Pokemon master!! 1. It's OK for ten jaar olds to run around a bunch of cities all alone with super-powered creatures that can kill them and do anything they want. 4. u can walk into someone's house and watch there TV and they don't mind. 6. Most houses don't have an upstairs of beds for the people who live there. 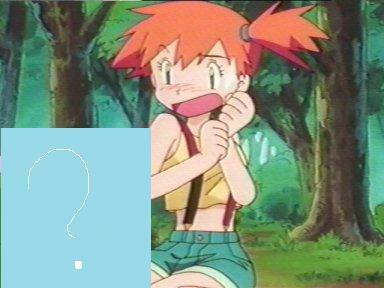 What Pokemon scares the crap out of Misty when she and Ash were in the forest?